Brown Belt is the final level before the Black Belt test. At our Krav Maga Worldwide™ certified schools, you will sometimes see this listed as “Level 5”, which denotes classes designed for Brown Belts, Black Belts, and above. At this level you will continue to learn to defend against guns, knives and sticks. The angles of attack become harder to deal with, and the stress level increases, but because this is Krav Maga, the principles remain the same. In addition to handguns, in the firearms section we learn to deal with long guns such as shotguns and assault rifles. Expect to train at least 12 months at this level, assuming a minimum of two training sessions per week. By the end of Brown Belt training, you should feel that you can stand in the middle of a room, eyes closed, and be able to defend against any sort of attack: a bearhug, a choke, even an attack with a weapon. The combative techniques described in the Brown Belt curriculum include more-advanced techniques, especially kicks that move beyond the fundamentals Krav Maga emphasizes. Among them are a number of kick combinations that include “switch kicks”. Think of switch kicks in this way: the second kick is already en route as the first kick is recoiling. It is the switch that makes the kicks a true combination, rather than just one kick followed by another. Brown Belt introduces throws and holds not emphasized in earlier belt levels. 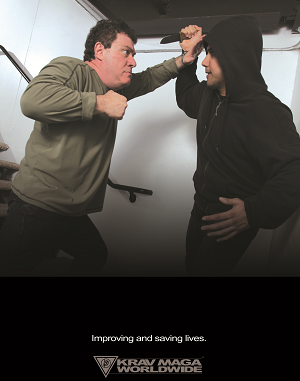 In general, Krav Maga prefers to strike rather than throw, since in self-defense the defender is not responsible for taking the attacker into custody, nor necessary in eliminating the attacker – only in eliminating the threat. Given this goal, a strike is often earlier and more available than a throw. However, there are situations in which, due to balance or position, a throw may be the easiest way to reduce or eliminate the threat. You should understand that the main goal is to slam the attacker straight down to the ground, not to throw them far away. Brown Belt includes hand defenses against knife attacks, as well as advanced defenses against high-risk handgun threats and long gun threats. Although we teach a kick defense against knife attacks in Blue Belt, we assume that most often the attacker will surprise us, making hand defenses necessary. One prerequisite for understanding knife defenses is a basic understanding of common ways to hold the knife. The three basic are regular (overhead) stab, underhand stab, and straight stab. 3. Defend, counter, deliver knees, get two hands on the weapon, then deliver more attacks. Very early; the defender is able to send the hands but also burst forward with the feet and defend the knife while it is back. Moderately early; the defender is able to send the hands and get his weight very much forward, but there is minimal foot movement at the beginning. Moderately late; the defender is able to send the hands forward and get some weight into the defense and counter, but with no footsteps at all. Very late; the defender succeeds in making the 360 Degree Defense and counterattack, but without much forward shift of weight. In this case, the defender gets as much weight into the defense and counter as possible. This last detail underscores an important element of Krav Maga training. All movements should cause the defender’s weight to move forward so that, even in very late stages, you are in the habit of putting as much weight as possible into the defense and counterattack. From all states of readiness, the defender must move forward aggressively, regardless of his ability (or inability) to move his feet. *These techniques and systems come from Brazilian Jiu Jitsu, Submission Grappling and Mixed Martial Arts. They are not part of the Krav Maga Worldwide(TM) curriculum but are taught by Koch Martial Arts as a supplement to the Brown Belt curriculum. Students testing for Brown Belt and higher will not be tested on these techniques. However, “live” groundfighting/rolling is a portion of the test and these skills will help tremendously.